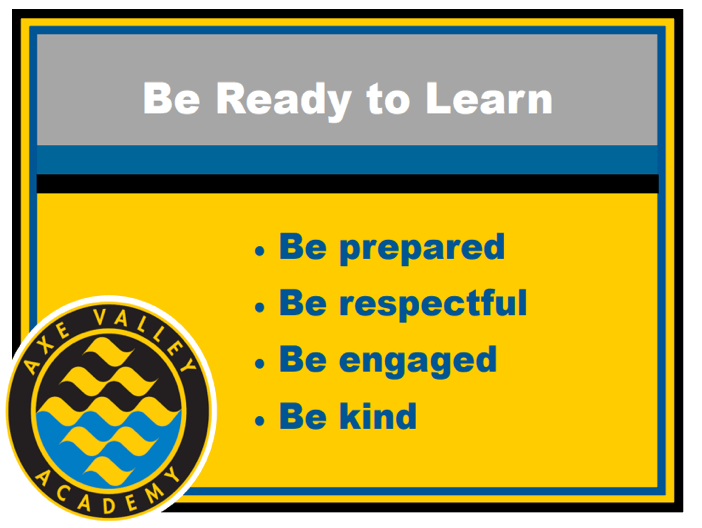 Ready to Learn is a new development to our behaviour policy, this is a strategy which has at its heart a drive to improve the quality of learning for all our students and will ensure that your child is able to make excellent progress at Axe Valley Academy. Most of our students identify that poor behaviour is rare but can sometimes disrupt student learning. At Axe Valley we are clear that we will not allow the behaviour of a minority of students to have a detrimental impact on the quality of learning for others. In the classroom the Ready to Learn strategy gives clear expectations for teachers and students and although it does not represent a change in our values and expectations it does enable decisive action to be taken to ensure that these expectations can be consistently and rigorously applied. For more details please click on the link below.